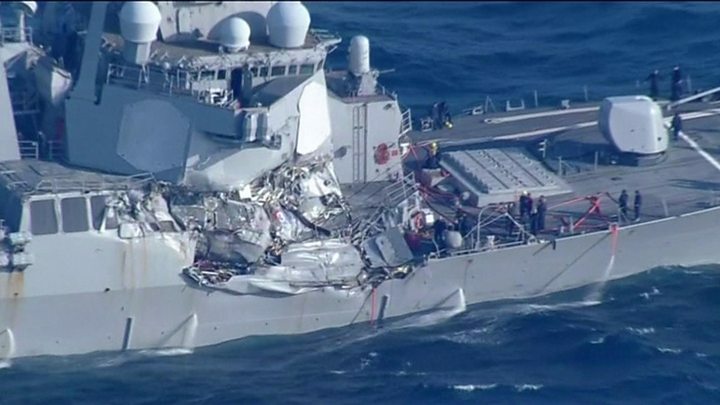 The Filipino-flagged ACX Crystal collided with the USS Fitzgerald in the early hours of 17 June in Tokyo Bay, causing a large gash below the water line of the destroyer and flooding lower decks. 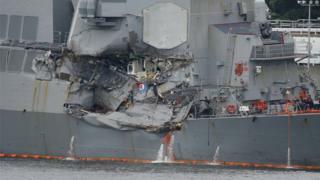 "The collision was avoidable," the US 7th Fleet said in a statement, adding that "both ships demonstrated poor seamanship". The dead sailors, aged 19 to 37, were later found in their bunks, after divers gained access to damaged areas of the ship. The commanding officer was trapped in his cabin by the force of the collision and five sailors had to use a sledgehammer to break down the door. "Even after the door was open, there was a large amount of debris and furniture against the door, preventing anyone from entering or exiting easily," a report into the incident said. The ACX Crystal sustained lighter damage to its port bow. There were no injuries among the 20 Filipino crew members on board the container ship. According to maritime rules, vessels are supposed to give way to ships on their starboard side which is where the destroyer sustained damage, sparking questions over whether the US ship could have been at fault.